If you have a conviction on your record whether it’s a fine or a prison sentence, you will have to declare it to potential employers and landlords. Maintaining your privacy under these circumstances can be difficult. Here’s our guide to your rights after a criminal conviction. With or without a criminal conviction, you are entitled to privacy under the Human Rights act. Plainly put, this obliges others to “respect your right to a private and family life”. When you are convicted of a crime, whatever your age, it is recorded on your legal records. You become obliged to declare this conviction when you’re applying for a job, a new home, insurance, or a credit card. After a certain amount of time (also called the ‘rehabilitation period’), you are no longer required to declare this conviction. The period depends on the type of sentence you were served; a jail period of more than two and a half years is never considered ‘spent’, but if you received a fine, community or probation order, this becomes ‘spent’ after five years. If, during investigations, police obtained information about you – like fingerprints, photographs, and DNA samples – you no longer have any right to request these be destroyed. Since the terrorist actions of 2001, police are entitled to retain prints and samples on their records. The media is required to respect your private life and you are entitled to sue for any breach. Your name and details are protected by the Data Protection Act, unless employers or organisations require these details because they are lending you money or hiring you in a ‘position of trust’. 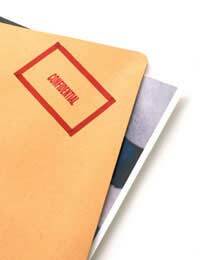 After a conviction, you may request a copy of your records from the prison office. The office must provide this to you within 40 days, but they may withhold certain information or take it out of your records before providing it. They can only do this where information includes a third party or affects the detection of crime. If there are any errors in your records, you have the right to see these corrected. You can also ask for your opinion to be added to the record if a dispute has been reported. What is Checked When You Apply for Employment or Credit? Background checks. General information that may be collected includes financial and security information, as well as information on your ethnic background – you don’t have to divulge this if you don’t want to. If you ask, the employer or agency should tell you what they will be checking for. Health checks. Your employer or agency is only permitted to ask for health information if they have good reason to do so. It should be relevant to the job. If you are concerned, you can ask about their record-keeping policy. A position in financial or administrative justice or regulation. Finally, whatever they decide, don’t forget that any information that an employer or agency obtains about your criminal record must be kept safe and private. The Data Protection Act prevents it from going any further. Are Your Concerned About Privacy? The Advisory, Concilation and Arbitration Service (ACAS) will be able to provide assistance on issues relating to data use and protection. If you believe that your privacy has been breached, your first contact is your local Citizens’ Advice Bureau.